The concentration of world income in the wealthiest quintile (20%) of the worlds population is shocking, and cannot meet any plausible test of legitimacy. 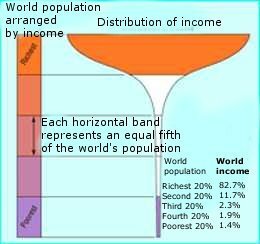 This diagram shows the distribution of world income by population quintiles. Ironically, it resembles a champagne glass, with a wide shallow bowl at the top and the slenderest of stems below. Many champions of free trade and free capital movements  like the recent interviewees in openDemocracy, Maria Livanos Cattaui (of the International Chamber of Commerce) and Peter Sutherland (of Goldman Sachs International)  argue confidently that globalisation spreads benefits throughout the world. Even as they affirm an active role for government, they would resist the idea that reducing world income inequality should be an objective of international public policy. In considering the impact of globalisation on inequality, the trend matters as well as the current picture. Many theories of growth and development generate predictions about changes in world income distribution. Indeed, the neoliberal paradigmwhich has supplied the prescriptions known as the Washington Consensus that have dominated international public policy about development over the past 20 yearsgenerates a strong expectation that as national economies become more densely interconnected through trade and investment, world income distribution tends to become more equal. If the paradigm was correct, this would be powerful evidence in favour of the law of even development, which implies that a developing country wishing to catch up with standards of living in the west should integrate fully into international markets - with lower tariffs, an end to trade restrictions, a privileging of foreign direct investment and foreign banks, and enforcement of intellectual property rights. The way to progress for developing countries lies, on this view, in allowing the decisions of private economic agents operating in free markets to determine the composition and volume of economic activities carried out within the national territory. Such an integrationist strategy would maximise the rate of development; or, to put the point a different way, the countrys development strategy should be, in essence, an integrationist strategy. This conception of income trends and policy strategy makes sense from the standpoint of the wealthy western democracies. It suggests that developing countries demand for western products and capacity to absorb domestic population growth both expand as they grow richer. The World Bank, the IMF, the WTO and the other global supervisory organisations are therefore quite justified in seeking to enforce maximum integration on developing countries for the common good. A lot is therefore at stake in the question of whether world income distribution has become more, or less, equal in the past generation. But how to establish the trend? There are various methods : using a measure of inequality (like the Gini), a unit of inequality (countries or individuals weighted equally), or a common numerical standard (market or purchasing power exchange rates). These can be used singly or in combination. Then there is the further question of what kind of data is usedthe national income accounts, or household income and expenditure surveys. However, the evidence suggests that of the eight possible measures of world income distribution, seven show varying degrees of increasing inequality in the last twenty years. And although the eighth (the Gini coefficient that weighs by purchasing power parity) shows no significant change, a recent paper by Steve Dowrick and Muhammad Akmal suggests that this contains a bias that makes incomes of developing countries appear higher than they are. However it is measured, the evidence points to rising inequality of world income distribution over the past twenty years. The trend is especially clear where market exchange rates, rather than purchasing power parity measures, are used to establish global income inequality. And using the former method, to convert incomes in different countries into a common numerical standard, is appropriate to most issues of global concern - migration flows, the capacity of developing countries to repay foreign debts and import capital goods, their marginalisation in the world polity. All four combinations of measures using market exchange rates show that world income distribution has become much more unequal. It is very difficult to establish with certainty the causes of the rise in world income inequality. But four causes can be identified. First, differential population growth between poorer and richer countries. Second, the fall in non-oil commodity prices - by more than half in real terms between 1980 and the early 1990s - which affected especially the poorest countries. A third, the debt trap, deserves elaboration. We have seen repeatedly over the 1980s and 1990s that countries that liberalise their financial systems and then borrow heavily - even if to raise investment rather than consumption - run a significant risk of financial crisis. The crisis pulls them back down the world income hierarchy. Hence the debt trap might be thought of as a world economy force distantly analogous to gravity. A fourth basic cause is technological change, whose recent form reinforces the tendency for high value-added activities (including innovation) to cluster in the (high-cost) western economies rather than disperse to lower-cost developing countries (Silicon Valley is the paradigmatic case). Technological change might be thought of as distantly analogous to electromagnetic levitation - a force that keeps the twenty percent of the worlds population living in the OECD countries comfortably floating above the rest of the world in the income hierarchy. If we have world economy analogues to gravity and electromagnetism, can the world economy analogue of relativity theory be far behind? The consequences of global income divergence are equally variable. One is the polarisation of the world system between a zone of peace and a zone of turmoil. In the first, a strengthening republican order of economic growth and liberal tolerance (except towards migrants) develops, with technological innovation able to substitute for depleting natural capital. In the second, many states find their capacity to govern stagnating or eroding. In the zone of turmoil, a rising proportion of the population find their access to basic necessities restricted at the same time as they see others driving Mercedes. The result is a large mass of unemployed and angry young people, mostly males. Economic growth in these countries often depletes natural capital and therefore future growth potential. Large numbers see migration to the wealthy zone as their only salvation, and a few are driven to redemptive terrorism directed at the symbolic centres of the powerful. The World Bank and the IMF have paid remarkably little attention to global inequality. The World Development Report 2000: Attacking Poverty, says explicitly that rising income inequality should not be seen as negative, provided the incomes at the bottom do not fall and the number of people in poverty does not rise. In fact, incomes in the lower deciles of the world income distribution probably have fallen absolutely since the 1980s. But an absolute rise in incomes of the lower deciles, and a fall in the numbers in absolute poverty, could still be accompanied by a damaging rise in inequality. The World Banks view that a rise in inequality need not be negative ignores the associated political instabilities that can harm the lives of the citizens of the rich world and the democratic character of their states. And this point holds even without any reference to notions of justice, fairness and common humanity. The global supervisory organisations - the World Bank, the IMF, the WTO, and the UN system should be giving the issue of global income inequality much more attention. If we can act on global warming (with similarly diffuse and long-term effects), why not global inequality? We should start by rejecting the neoliberal assumption of the Bretton Woods institutions over the past two decades, now powerfully reinforced by the emergent WTO, that the only viable development strategy is domestic reform to facilitate maximum integration of each individual economy into the world economy. The evidence on world income distribution casts doubt on this. International public policy to reduce world income inequality requires a different policy orientation for these organisations. The key change would be to allow governments to focus and nourish domestic strategy and institutional innovations. My book, Governing the Market, discusses the principles that might guide such a course.